Shark, the French helmet manufacturing company, has launched a set of new ‘Winter Test’ helmets. Are you wondering what this ‘Winter Test’ title is all about? Well, it is definitely related to the world of MotoGP. The 2018 MotoGP season is now over and the winter testing has started. Riders test their new bikes looking for improvements. This is a crucial testing period especially for those riders who have switched teams. Lorenzo, Zarco, and Redding wear Shark helmets. So the new Winter Test helmets are replicas of what these guys wore during the winter test. 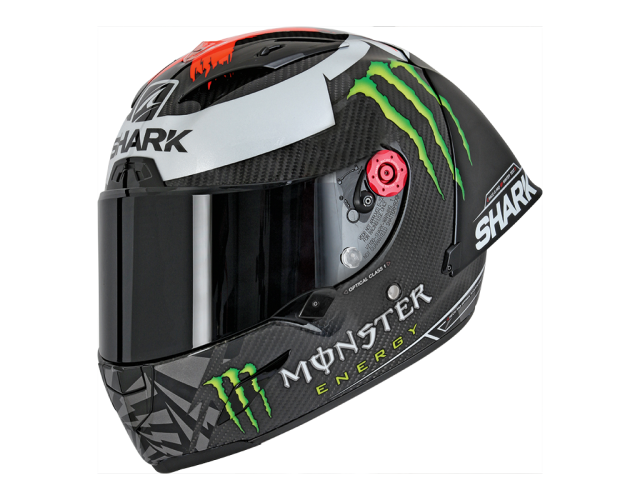 These helmets are based on Shark’s Race R Pro shell, which is its top-end product. They have a cool black design with winter test graphics. The coolest feature of these helmets should be the radical aero spoiler at the rear. It is super cool. You also get a special anodised visor hardware, and a titanium double-D ring fastening on the strap. Weighing at just 1400g, these new helmets are pretty light. Inside the box, you get a proper factory dark visor along with a few extra sponsors stickers. You also get an exclusive winter test helmet bag and kit bag. Of course, all this comes at a hefty price tag. Next articleWhat’s The New Norton Superlight All About?